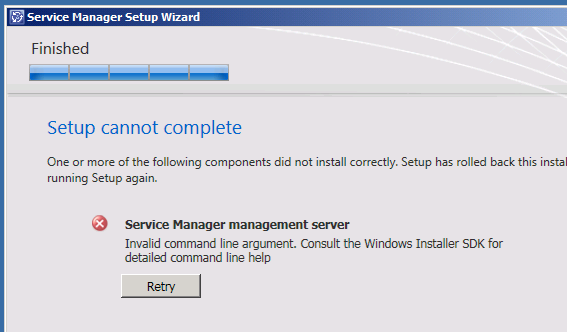 If you are installing System Centre Service Manager 2012 (SP1) and are receiving what appears to be quite a generic error Error: “1639. Invalid command line argument.” then hopefully this will save you some time. Having spent a good few hours installing & reinstalling, trying different operating system versions (even though they were on a office supported list) I decided to pay attention to what the log file was actually telling me. Each time the installer got to the same place with “Setting SDK username and password”. The password I was trying to use in my lab environment and a ‘@’ symbol in it (no prizes for guessing what the password was I was trying to use!) Once I had changed my password and removed the @ symbol everything sprung into life. This is rather annoying as the wizard itself accepts and is quite happy with password during the process or specifying the service and workflow account details. Hope that saves someone a bit of time if they come across a similar issue. Generation 2 VMs – The new type of virtual machine. With the release if Microsoft Windows Server 2012 R2 there will be two options when you come to create your VMs – Generation 1 or Generation 2 VMs. No performance improvements on Gen2 VMs. Having said that booting is around 20% faster and OS install can be 50% faster. If you look at a Gen1 vs. a Gen2 settings screen below (Gen1 is on the left with Gen2 on the right) for Hyper-V you will notice a lot of the options you are use to appear to be ‘missing’. This is because things such as the IDE controllers are no longer needed – you can use the SCSI controller to boot! Other options that are no longer needed for Gen2 is the COM and Floppy ports. Also there are no longer any emulated devices. Gen2 machines now fully support UEFI rather than the traditional BIOS – you can see on the Gen1 settings on the left you have the usual ‘BIOS’ options and on the Gen2 you have ‘Firmware’. With UEFI secure boot has been enabled by default to protect your VMs during the boot process. One thing that will please a huge number of Hyper-v users will be the ability to do full PXE booting – you no longer need to use the emulated network adaptor (emulated network no longer exists) you have the full network bandwidth. As mentioned above, Hyper-v Gen2 machines no longer need emulated devices. You can see this below with the device manager. Again Gen1 is on the left with Gen2 on the right. The Gen1 clearly shows the emulated devices under the PCI to ISA bridge (Microsoft used the ISA bridge to prevent the need to consider Plug n Play). 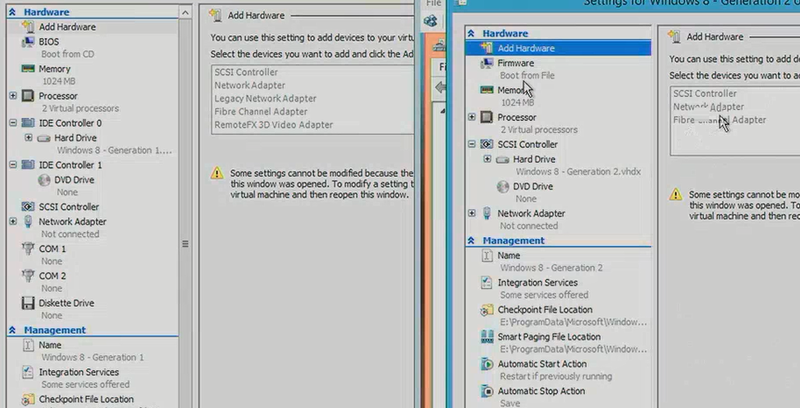 With the Gen2 device manager you can see all the devices are running through the native VM Bus. Finally one feature that I have been waiting for since working with Hyper-v although very trivial is copy and paste. Hyper-v will now allow you to copy and paste text and even files both ways between VMs (just like with RDP). Sound is also now available within the VM – play a video in the VM and hear the sound on the local machine. As always though there are some gotta’s with this new technology. You must be running at least Windows Server 2012 or Windows 8 x64 operating systems and once you have made the decision on the generation of VM you want to use you can’t change it. Due to some of these limitations Microsoft have stated they are aware people will need Generation1 VMs for quite some time so these traditional virtual machines you are use to and all the settings that go along with them are not going away anytime soon. Having said that if you are using Windows Server 2012 (R2) or Windows 8 (.1) Generation 2 is worth a look. Microsoft has now made available the download links for people wanting to try out Windows Server 2012 R2 and the new features that were announced at TechEd North America a few weeks back. There are four different versions available depending on your need. It is worth noting that these versions will expire on January 15, 2014. Also available today are the preview versions of Microsoft’s System Centre Suite 2012 R2 & SQL Server 2014. Although the Hyper-v 2012 management pack available for SCOM 2012 is very good at monitoring Hyper-v (http://www.microsoft.com/en-us/download/details.aspx?id=36438) people over at CodePlex (a site dedicated to open projects you can participate in) have released another management pack with some additional features. As usual with this type of software – you should test it fully before being used in a production environment. Recently I have had problems syncing Run Books for System Centre Orchestrator into System Centre Service Manager, if you go to Service Manager and manually run a sync job the sync will finish successfully but your new Runbook will not show up. Also if you go into the Orchestrator web console you won’t see the Runbook listed there either. This is a known issue by the looks of this Microsoft blog article. Once that is complete, re-run the Service Manager Runbook Sync and everything will be as expected. No great surprises really but at TechEd North America Microsoft has announced that System Centre R2 and Windows Server 2012 R2 will be made available. When Windows Server 2012 RTM was introduced, Microsoft announced it as their ‘Private Cloud’ operating system. With Windows Server 2012 R2 they have started to introduce more of a ‘hybrid cloud’ feel making it much easier to migrate from on premise to off premise and into, surprise, surprise Windows Azure. With Windows Server 2012 Microsoft addressed a long outstanding problem – NIC teaming. Until 2012 RTM Microsoft did not support any kind of 3rd party NIC teaming so instead they built their own. It had some great features (have a look here for a full list) and has been heavily used by Windows Server 2012 customers. R2 brings new functionality such as “Flowlets” (Microsoft’s name for it) – traffic is now spread evenly over all NICs in the team. Windows Server 2012 RTM featured the ability to block or allow traffic based on the source and destination VM. In 2012 R2 you will be able to take this a step further and block or allow traffic based on the actual workload. This works by having the ability to perform stateful packet inspection on the fly. The traffic can now be accessed on network address, protocol or even port. There have been great improvements in the network virtualization capabilities within 2012 R2. 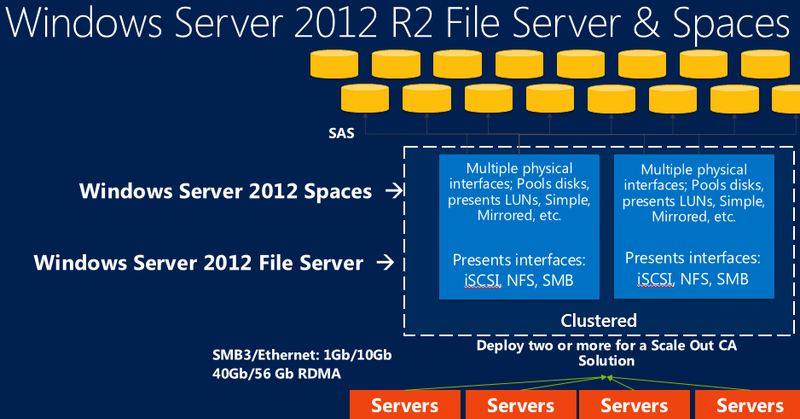 Windows Server 2012 was really built (and marketed) for Private Cloud, with R2 there is much more focus on service providers and making it easier for them to host multiple tenants. The advances in network virtualization really prove this. I’ll look more at what has been done here in another post as there is so much. One big problem with 2012 was how to break out of your virtualized network and into the ‘real world’. For network virtualization Microsoft opted to use the NVGRE protocol which needed an expensive gateway device – this is now built in and part of 2012 R2 you deploy your own gateway device onto Hyper-v! This will also support site to site VPN access to allow you to get your internal network talking to your service provider hosted VMs. For a while now Microsoft has been trying to provide a way for people to move away from large & usually very expensive SAN devices (although SANa are fully supported with features such as trim and ODX), an example is Microsoft Exchange – Its been encouraged for a while not to use a SAN and instead use DAS and DAGs for your mailbox storage. Storage spaces are another example of this. 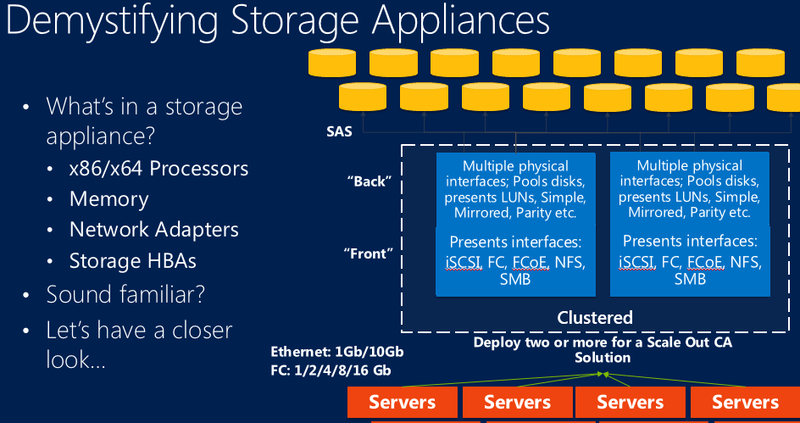 A good definition of a storage space is that it’s just like – well a SAN. In the background you have your disks (something I found interesting was that 15k SAS disks are generally 5x as expensive as 7.5k disks but only have 2x the IOPS – in other words use SSD for performance and 7.5k disks for capacity). In the foreground you have your Windows fileserver with storage spaces to carve up the disks, perform the management, provide the ability to set redundancy options such as RAID levels. Storage Tiring (New feature) – Allows you to use traditional HDD’s and SSD which allows high priority files to use the faster SSD while less important files can use the traditional HHD. Data duplication (enhanced) – allows for online data duplication even when VMs are running. Hyper-v replica was a hugely popular feature of Windows Server 2012 Hyper-v 3.0. Some of the competitors in the virtualisation market aka VMware have allowed for replication of VMs to another site for DR for a while using products such as SRM but this is very expensive and complicated to setup. Hyper-v in 2012 had this built inbox – for FREE! Microsoft have improved Hyper-v replica in R2 as you would expect. You can now perform synchronization every 15 minutes, 5 minutes or even every 30 seconds. This means if you lost your primary site you would only be 30 seconds behind! Loosing 30 seconds of data would be more acceptable for many businesses especially businesses that have yet to make this jump are are still doing the old fashioned tape backups each evening – yes there are still some out there! Another new feature of R2 is that you can extend the replication to a tertiary site. This will be useful if you want another backup of your data ‘just in case’ but is aimed more towards service provides who offer a service for a customer to replicate to The service provider can then they can then backup your data to their DR site too. Server 2012 R2 offers some fantastic new features and really builds upon 2012 which was already a great server operating system. This new release is aimed to get service provides on board and allows you to really work towards the Microsoft vision of the cloud – that involves your provide cloud, the service providers and its Azure service. Change the VMSwitch of all VMs on a host. I had a requirement today to change the VMSwitch associated to all the VMs on my Hyper-v host. Obviously if you had time on your hands an really wanted to you can go through and change each one individually with the mouse but far more efficient would be to use PowerShell! This won’t work though as you can see here the -VMName does not accept a piped input. And instantly all your VMs will be on the new adaptor. The big day is here. Windows Server 2012! !